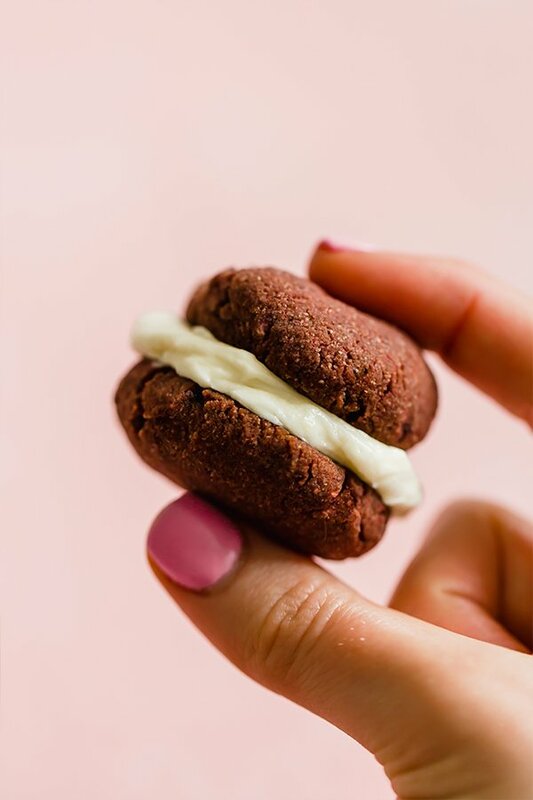 These red velvet whoopie pies are little bites of heaven! They’re naturally colored and are totally paleo, gluten free, dairy free, and AIP. 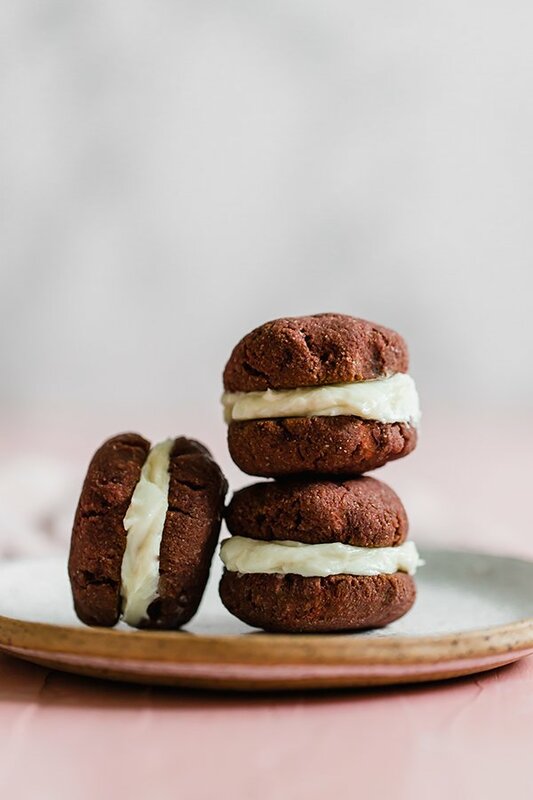 I’ve been wanting to make whoopie pies for quite some time. Soft cookies and creamy filling? Yes, of course, I want that! What better time for cute little treats than Valentine’s Day? I don’t ever make a huge deal out of Valentine’s day, but baking a little something can be a fun treat to give family, friends, or to just make for yourself. Red velvet is the next best thing after chocolate on valentines day, but I was put off by the unnaturally red color that’s often from food coloring. You can totally make red velvet without food coloring and while adding in some superfood ingredients… beets! No wait, don’t go! I promise these don’t taste like beets. 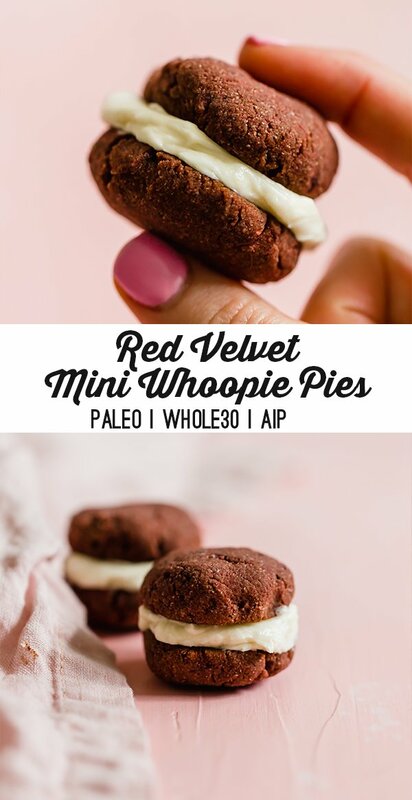 These red velvet whoopie pies taste sweet, creamy, and don’t have any artificial colors or flavors in sight. 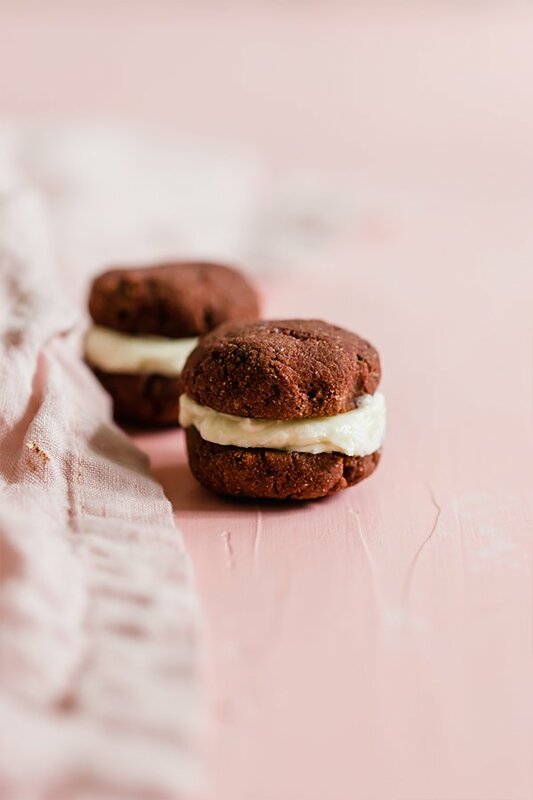 One thing to note about these whoopie pies is that they’re little guys! These are mini’s, and I prefer to make them that way so they hold better, and there’s more to share. I haven’t tried these are larger whoopie pies, but I assume it should work okay. This is the flour blend that I used for the cookies to keep them gluten and grain free. You should be able to use tapioca starch in place of arrowroot, but I cannot recommend a swap for the coconut flour. As I said, you can’t taste it! It really just colors the cookies. You’ll boil the beet to soften it and then puree it so the taste and texture disappear in the cookies. This helps to mask some of the beet flavors. If you’re AIP, use carob powder. This makes the cookies nice and cakey and is the base of the cream filling. Use maple syrup if you’re making these vegan, but honey will work too. Any swaps for coconut flour? I can’t have it. YuM! I love that this is both vegan and gluten-free and also so pretty! Happy Valentine’s Day! They turned out just the right amount of sweet?! I do have a question, as I’m super novice at baking! I used a heaping tablespoon and the cookies turned out regular sized and not mini. Was this too much?